Dealing with tantrums and meltdowns is a real concern. They can happen any time whether at home, school, the shopping center, on play dates and so on. But it’s important not to confuse one with the other. Though they may seem similar to the untrained eye, I can assure you they are not. 2 What are Autistic Meltdowns? 3.1 How to Spot a Tantrum? Everyone, at some point in their life, has thrown what is known as a temper tantrum or ‘hissy fit’ as I like to call them, over something we didn’t get, or a situation that didn’t quite go the way we wanted it to. You’ve lost your temper and you’re acting out. This mainly occurs in early childhood when a child (not necessarily a child with autism) doesn’t get what they want, is manipulative or simply naughty, deviant and/or rebellious. However, as a child develops intellectually and learns key negotiation skills, these tantrums are likely to stop, because it becomes easier to reason with your child. Also as their coping skills improve, their sense of responsibility grows, and they begin to understand consequence these tantrums are likely to become a thing of the past. Notably, tantrums are not as hard to deal with as meltdowns and as you can see, they are something every kid goes through. What’s important is learning how to differentiate between them, but we’ll get into that a bit later on. A meltdown, on the other hand, is a systemic breakdown that throws your whole world upside down. You feel powerless to stop it. The person having the meltdown may be unable to process emotions, thoughts, and sometimes even can’t control their own motor functions. In fact, it can be quite dangerous. Arms flail, bodies can be thrown to the ground and if someone isn’t there who understands what’s going on and how to deal with it, the person having the meltdown could get hurt. The feeling of a total loss of control can leave the child feeling exhausted. A meltdown requires a lot of physical and mental energy. Trying to make sense of what happened and gather themselves and their thoughts after such an episode can be quite daunting, and the child will need as much reassurance as possible. You can image it is not a pleasant experience. The key to dealing with a meltdown is staying calm. If you get stressed it will stress your child more and make the situation worse. Showing kindness and compassion is also a key component in dealing with these situations successfully, and though it’s easier said than done, it is something that can be improved upon over time. Weighted therapy and deep pressure therapies have been deemed very effective ways to settle down people affected by autism and the meltdowns associated with it. There are various forms of weighted therapies, and some of them are mobile such as weighted blankets, compression clothing, weighted lap and shoulder pads, to name a few. 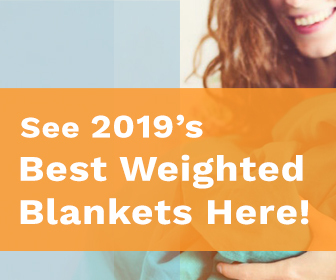 Letting your child sleep under a weighted blanket is a surefire way to improve their sleep and help calm them during stressful situations such as a meltdown. As I’ve mentioned tantrums and meltdowns are not the same thing. Tantrums are much less severe than meltdowns and are more easily managed, and meltdowns come from a place of severe emotion and inability to process sensory experiences whereas a tantrum is purely behavior-based. Let’s delve a bit deeper into these themes. How to Spot a Tantrum? It’s very simple, a tantrum is a type of bad behavior. It’s a choice, it can be controlled, and it is simply to provoke a reaction, or get a certain result. A tantrum can be defined as an action with purpose. The child or person wishes a certain result from their behavior, mainly something that is relatively selfish that will benefit only their wants, not necessarily their needs. A tantrum is usually ‘performed’ in front of an ‘audience’ and when the attention is removed, the tantrum usually ends as there is no-one to act for and no-one that can give the child what he or she wants. It’s important to remember that how you deal with a tantrum will set the tone and set a standard expectation with your child. If you simply give in to their demands they will act out again and again, you are showing them what lengths they can go to, to get what they want. It’s vital here to set strict boundaries and to provide consequences for this poor behaviour such as losing games, toys, privileges, cellphones, playtime and other things the child may love. This type of behavior should not be condoned. When a child realises they had no result from their tantrum, the outburst will stop. Give in to the behavior and you’ll be back at square one in no time. When the meltdown happens the person loses control over herself, is unable to think rationally or make sense of their environment and a meltdown ensues. I like to refer to it as a breakdown of regular behavior. The effect of a meltdown is involuntary and cannot be controlled. The processing ability of the autistic brain is wired completely different to a person without autism. There is a delay between the brain’s processing time and present time actions and decisions that need to be made. Senses are also interpreted inversely so it can literally be painful to experience certain circumstances. An excess of choices, sounds, colors, lights, smells, people, or the inability to problem solve on the spot, can trigger a meltdown. In these situations, the body’s defense system, or fight-or-flight response is triggered. If the fight response wins a breakdown follows. Now, this meltdown can occur in many different ways and unfortunately it affects people with autism throughout their whole life span, not only during childhood. Children can act out, run away, fall to the floor, kick and scream, curse, bite, scratch, throw things, or hit themselves or people around them. That’s why I mention the fact it could be potentially dangerous. A meltdown can be a quick few minutes, or it can last for hours at a time. It is very unpredictable. An autistic meltdown is simply the body’s coping mechanism to gain balance by exerting a lot of energy. It is also very hard to calm a meltdown and in many cases, will end only when energy has been totally exhausted. Merely giving in to the child’s demand, or eliminating your attention will not stop a meltdown as it does a tantrum. It is vital to maintain the safety of the person having the meltdown rather than trying to stop it. As I’ve mentioned it will end when the necessary energy has been used. In very extreme cases the person or child experiencing the breakdown may be unable to calm themselves after the energy has been used. A routine to calm and reduce the overload is essential in these cases. In these cases, prevention and preparation are always the best approach. A child with Autism will need to be prepared for what comes next, he should know what to expect. I’m sure you’ve heard someone (maybe in the workplace) or at some other point say, “give me all the information so I can mentally prepare myself”, it’s the same for your child. Preparing them for what they are to expect of the outside world or the venue you’ll be visiting will help prevent possible meltdowns or at least make dealing with them a lot easier. In both cases, tantrums and meltdowns, seeking a treatment plan or advice from a behavioral therapist, is sure to set you up for success. A therapist can teach you best techniques on how to handle stressful situations that you can practice in your home. I’m going to mention this particularly for the use during meltdowns. However, I wanted to reference that the general benefits of using a heavy blanket on a daily basis can be greatly beneficial to both a child with or without autism. The deep pressure therapy it provides will increase serotonin levels, reduce stress and anxiety and help your child get better quality sleep. These benefits will definitely help your child cope during the day as they’ll wake up refreshed instead of tired and irritable. Dealing with a tantrum is a lot less complex. Simply ignoring the child throwing the tantrum is enough to make them stop. Regardless of whether you are in public or not. When you are in public and your child throws a tantrum because they can’t play with their favorite toy at a playdate or get the sweets they want from the shop and ignoring doesn’t work, remove the child out of that environment. Leave the venue and go home. Taking the child away from the situation and not allowing them to get what want anyway is a sure-fire way to end the fit and set the right standard for the future. If you are at home, it is simple, put them in a “time-out’ corner and leave the room. This will very quickly quiet them down when the attention is no longer on them. Remember that a sensory meltdown is something much more serious than a tantrum and requires finesse in dealing with it. You can prepare yourself and your household with a few things to help calm these situations. Let’s face it, at some points you’re going to need to go out. So here are a few ideas to help prepare you for what may come. Make sure both you and your child have eaten a well-balanced meal, and had enough water to drink before leaving the house. Preventing a decrease in blood sugar levels is vital in the prevention of a glucose related meltdown. Why do I mention water? Because dehydration can also be a factor in these meltdowns so make sure you are both well hydrated. Keep your child’s favorite songs on your phone or their own device. Let them listen to it while you are out and about. This could help them cope with the surroundings and possibly prevent a meltdown. If your child is sensitive to noise, then it’s a great idea to have them wear headphones that prevent auditory overloads. White noise could also help keep your child calm down and even help with sleep. I’ve also heard of parents downloading ‘whale music’ to help keep a child relaxed. These days practically any game can be downloaded and taken on the road. Bring an electronic game along and if you notice your child showing signs of discomfort, you could have it up your sleeve, it could distract him from a possible meltdown. I’ve mentioned weighted blankets, lap pads and shoulder pads before, but I’ll say it again. This is an excellent way to help calm your child and give them a sense of safety and security. An autistic meltdown can leave a child feeling very exposed, therefore the sanctuary of a heavy blanket or lap pad can bring great relief. You can bring a weighted blanket or pad with you anywhere you go. It can be used all the time to provide a feeling of comfort and protection, especially when in a new environment. I’ve seen parents put them over their child while in the shopping cart. Works like a charm. Similar to weighted therapy, compression clothing, like weighted vests, will help still your child as it mimics the sensation of a safe embrace. Constantly squeezing a stress ball will help your child focus their energy on what they are doing rather than what is going on around them. As I’ve mentioned before, preparation is better than cure in these cases. It’ll be very important for you to notate regularly when meltdowns occurred, what could have been the triggers, did your child eat or drink anything beforehand and what calmed your child down and so on. This will help you in the long run, to be better prepared to catch and probably stop meltdowns before they begin or to better deal with them in the future.